Welcome To Day 6 Of Baking With Pumpkin! Apparently AFN was allowed to air 2 games today and I missed all but about 15 minutes of one game. I had other things to do today and did not know till it was too late that some football would be on. So AFN is supposed to slowly go back to all regular programing this week…so I can look forward to Football Friday at least! I don’t know about you but I absolutely love a made from scratch cinnamon roll every now and then. They tend to be a little bit of work but in the end, so worth the time and effort involved. 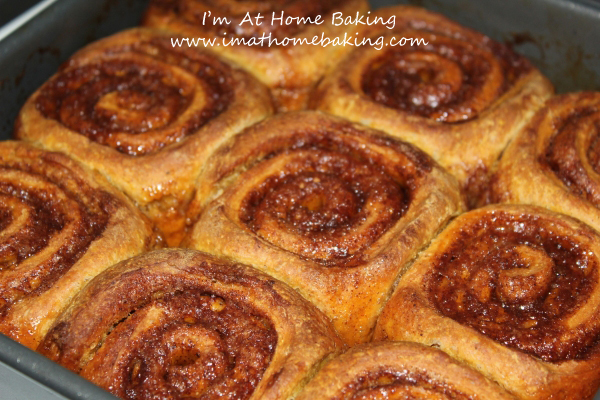 I have a favorite cinnamon roll recipe I use and quite frankly over the last year I have not tried anything different. Since I am doing 30 days of baking with pumpkin, trying a “new” cinnamon roll had to be done! I’ve seen a few recipes floating around for a while now. I love pumpkin and I love cinnamon rolls and so I figured it would work well together. I made these yesterday for our Sunday Brunch. They do take about 3 hours in total to make & bake, but please don’t let that stop you. Try them. You may find you enjoy them as much, if not maybe even a little more than the traditional cinnamon roll. I enjoyed them very much and my husband really did too. Nothing can take the place of my regular cinnamon rolls but there sure is room to switch them up to pumpkin ones once in a while, especially in the fall. You could add nuts to the filling but I personally am not a nut fan, so I omitted them or if I make them for others I will also omit. You could also change the filling around. I am posting my adaptation of my own filling that I tend to use in all my cinnamon rolls, I enjoy the smell & taste of it and seemed more appealing to me than what the recipe stated. You could also make these the night before and just keep them in the fridge, just let them sit out about 30 minutes before baking! Place the dough in a lightly greased bowl, cover the bowl, and allow the dough to rise for about 1½ hours, until it's almost doubled in bulk. To make the glaze: In a medium bowl with an electric mixer, combine the cream cheese, butter, maple syrup, confectioners' sugar and pumpkin pie spice. Mix on low speed until thoroughly combined and creamy. Feel free to adjust the frosting to meet your needs. If you like a thinner frosting, add in a little milk (start with 1 teaspoon) and slowly increase until you reach the desired consistency. If you want it to be thicker, add in a little more confectioners' sugar. If you would like, use all-purpose flour instead of half and half. Just make sure to decrease the water just a little, unless like me...I needed it all. They really are Shay! Wish I could make some to send to you!! I used bread flour instead of all purpose flour and it worked out nicely!